Why Did the Chickens Cross Under the Highway? Over the generations, chickens have become so domesticated that it’s rare to see any living in the wild. Instead, these fowl almost always live on or near farms, backyards, or other closed-in areas in the proximity of people. But there are, indeed, feral chickens — birds who find a home on their own. That is, every once in a while, a chicken really will cross the road, hoping to get to the other side. And sometimes, they stop halfway. If you’ve ever been to Los Angeles, you know that the highways are the connective tissue that binds the area together. Among these thoroughfares is U.S. Route 101 (pronounced “the one-oh-one” by locals), one of the most important among many such freeways. The part of the 101 which runs through Los Angeles itself is known as the Hollywood Freeway — it runs 17 miles, extending from Downtown Los Angeles in the south to North Hollywood in the north. Along the way are many exits, including one for Vineland Avenue. A lot of people live off Vineland Avenue, but we don’t care about them right now. We care about the creatures living under the exit ramp — a few dozen guys like the ones pictured above. Meet the Hollywood Freeway Chickens. The chickens — well, their ancestors, at least — have been there since the late 1960s or early 1970s, but origins of the flock are unknown and debated. The most commonly told story is that a poultry truck overturned on the highway, sending most of the payload to, as Snopes described, “the Great Chicken Bucket in the Sky,” but leaving some surviving birds to fend on their own. There are alternative explanations, though; there are a few people who independently claim to have relocated the chickens there, all with similar stories — as kids, they took in some chickens as pets, the neighbors complained, and bringing the birds to this small plot of open land was an act of mercy. Either story is plausible, and ultimately, we don’t know how the birds originally got there. But we do know why they stayed. In 1975, local news reported that a nonagenarian retiree named Minnie Blumfield had taken them under her wing, feeding the birds on a regular basis for years. As the Sarasota Herald-Tribune reported that summer, Blumfield spent, on average, about $35 a month (roughly $160 in today’s dollars) on “birdseed, chicken feed, and water” for the fowl, and then twice a day would tend to her flock. At the time, chickens, then about 40 in number, would “greet Mrs. Blumfield’s arrival with a clucking that almost matches in volume the roar of traffic on the adjacent freeway,” per the Herald-Tribune. Regardless, this flock won’t seem to fly the highway coop. Despite numerous attempts to relocate the birds, something always goes wrong. 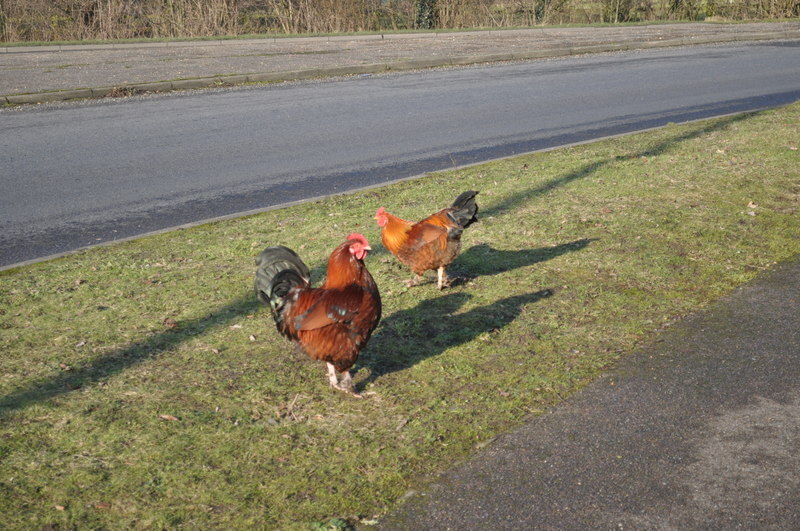 Even today, there are chickens which call the space under Vineland Avenue off-ramp their home. From the Archives: An Unsanctioned High 5: Meet the man who fixed Los Angeles’ highway signs — without permission.